The editors and publishers who packed the Seaport Hotel conference room wanted to hear how a newspaper company could become a growth story in this digital age. But they were also there because it was one of their own delivering the message. Kirk Davis, the controversial chief executive of GateHouse Media, sketched out the driving factors behind his company’s expansion: the centralized design desk, the additional markets for digital ad sales. He glossed over the downsides: the layoffs as work gets shipped to Texas, the labor strife in Providence and Peoria. 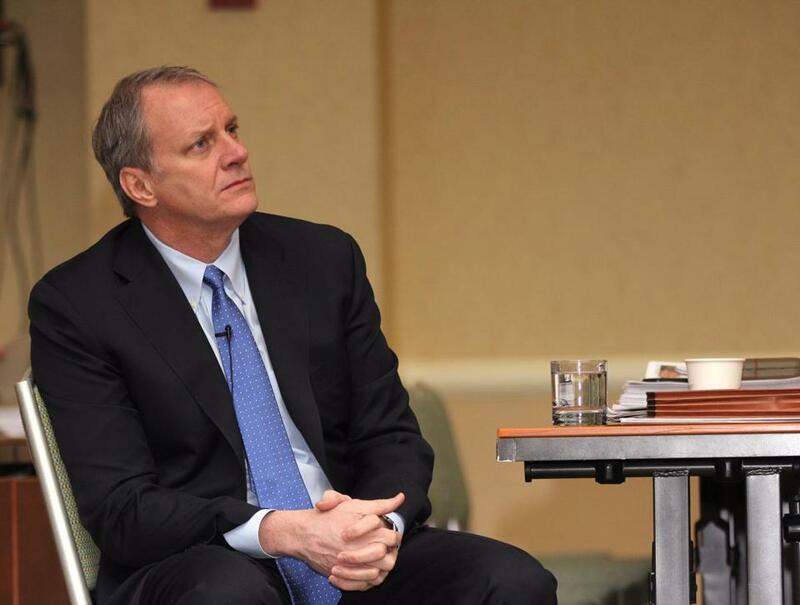 The crowd at the recent New England Newspaper & Press Association meeting heard how the affable 53-year-old executive has led the industry’s biggest shopping spree in the past year, emerging as one of its most prominent figures. In Massachusetts, Davis’s dominion encompasses nearly every community east of the Quabbin. Davis recently brought a couple of New England’s biggest papers into the fold — The Providence Journal, which came with printing presses, and Worcester’s Telegram & Gazette, which didn’t. This chain now includes 115 daily papers across the country, and many more weeklies, collectively staffed by nearly 9,000 employees. Dailies in Quincy, Brockton, Framingham, Taunton, Fall River, New Bedford, Milford, and Hyannis are part of the family. Parent company New Media Investment Group accounted for half of the sector’s M&A activity announced in the country last year, and has spent more than $500 million on deals since September 2013. Davis has a Needham office, a house in Hopkinton, and a headquarters in Pittsford, N.Y. But his real home these days is on the road. While New Media chief executive Mike Reed is the behind-the-scenes deal maker, it’s Davis who hops on a plane to Daytona Beach or Las Vegas to meet with affected employees, the person who ties it all together, preaching the GateHouse gospel. As a result, he’s become a polarizing figure. Many journalists who work for him, as well as those who lost jobs amid all the empire-building, grumble about the years without raises, the colleagues with pink slips, Davis’s near seven-figure pay package. But Davis is taking a chance on papers that many other newspaper execs wouldn’t touch, and he said he sees a centralized approach as a path to protect profitability. “Much of what we’re doing right now is figuring out how to fund local journalism, to try to preserve front-line reporting resources,” he said. Wall Street isn’t complaining. New Media shares have essentially doubled in value since the firm’s stock market debut on Valentine’s Day 2014. Executives just increased dividends by 11 percent. Year-to-year revenues at comparable papers in the fourth quarter of 2014 were up 1 percent, a victory in a revenue-challenged industry. To understand how Davis is doing this, go back to his first gig in the Boston area. Fidelity Investments recruited Davis to its Community Newspaper Co. arm in 1995, and Davis soon ascended to the top spot at CNC. He rubbed elbows with top Fidelity executives, picking up on management techniques and M&A skills. Davis left soon after Boston Herald publisher Pat Purcell purchased CNC in 2001.But he returned in 2006 as CNC merged with a newly created GateHouse. Loans were readily available in those days, and GateHouse gobbled up papers in various parts of the country. When the economy tanked in 2008, GateHouse and other newspaper buyers were suddenly stuck with mountains of debt. Many headed into bankruptcy court to clear the decks. By the time GateHouse filed for bankruptcy protection in 2013, it was time to expand again. 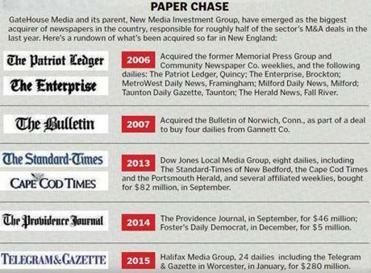 Its primary investor, Fortress Investment Group, engineered the purchase of Dow Jones’s community papers, including the Cape Cod Times and the Standard-Times of New Bedford, through a Fortress affiliate. The post-bankruptcy GateHouse and former Dow Jones papers were later combined in a new public company, New Media. The plan is to put all the holdings under the GateHouse banner. Reed and Davis set an ambitious goal: $1 billion of deals over three years. They’re paying for these deals with new debt, the sale of New Media stock, and operating cash flow. Reed has told analysts there’s at least $75 million available in debt to do more deals and at least $70 million in cash from his papers for acquisitions this year. Many journalists would rather see that money go back to their strapped newsrooms. Jeff Gordon, president of the United Media Guild in St. Louis, said labor actions are underway in Massachusetts, Rhode Island, and Illinois to protest working conditions at GateHouse papers. The union plans to launch a radio ad campaign in Springfield, Ill., this month. Then there’s the question of whether the GateHouse team is growing too quickly, again. Davis and Reed answer that by saying they’re being disciplined — buying profitable papers with beaten-down values — and they’re keeping the debt under control. There are other differences, with a digital marketing arm in Quincy now and a centralized page design desk in Austin, Texas. In less than a year since the design center opened in the spring of 2014, the company has built the workforce to 140 people, cranking out pages there. This growth, of course, has come at the expense of jobs across the country. The Providence Journal lost about a dozen copy editors last month, for example, and Jim Romenesko’s media blog this month reported layoffs at several Halifax Media papers acquired by New Media. “They are finding that even in 2015, there can be lots of efficiencies in these enterprises, which is somewhat surprising given that we’ve had cutting for seven or eight years now,” said Ken Doctor, a media analyst who runs the Newsonomics blog. But some say it’s not just jobs that are being lost. Davis said the Austin desk offers services to smaller papers that wouldn’t normally have access to sophisticated page designers. Eventually, he wants to sell its services to other media companies. The company’s digital marketing venture, based in Quincy and known as Propel, is already bringing in business, building Web and social media pages. The more papers in the fold, the more markets for Propel to target. The unit collected $18.5 million in revenue last year, tripling its 2013 revenue. More than 135 people work at Propel’s office in North Quincy, and Davis said the company wants to open a Boston space this year, to recruit more software engineers.